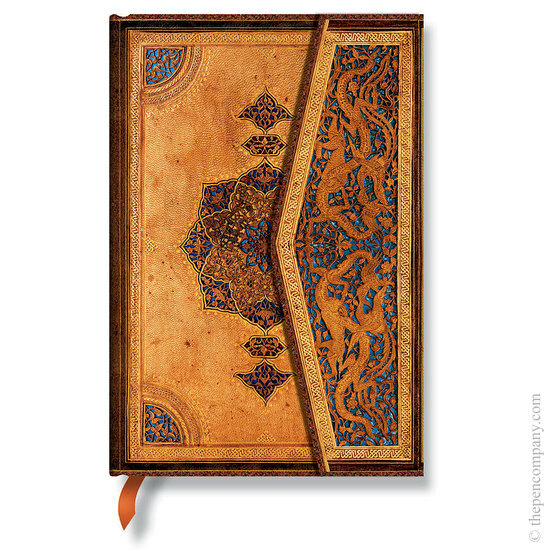 Ancient Islam is praised for bringing many wonders to the world, and decorative bookbinding was certainly one. Refined symmetry is a constant feature running throughout the simply tooled geometric patterns of the 14th century to the complex designs of the 16th century. The Safavid dynasty were one of the most significant ruling dynasties of Iran and the Persian Safavid-style designs associated with the Islamic Golden Age represented a peak in the art of binding. This journal portrays a leather filigree pattern featuring handtooled surfaces and motifs that retain an elegance and style even in our modern context.The geometric patterns celebrated in the Safavid range are inspired by the ancient Persian Safavid-style. Emerging during the Islamic Golden Age, symmetry and geometry are central features of these designs. Quadrants, medallions and flora and fauna are used to create exquisitely patterned covers evocative of the decorative bookbinding of ancient Islam.